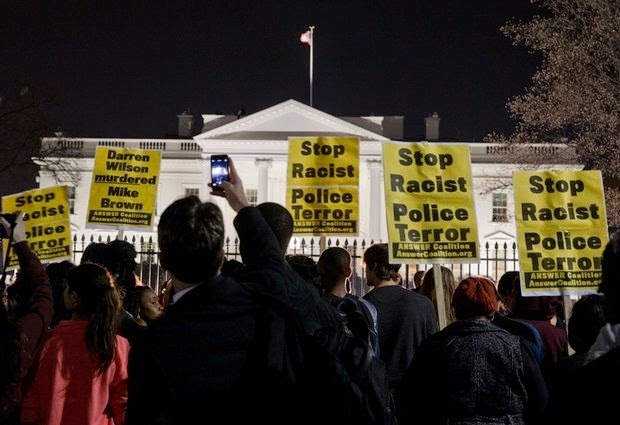 A crowd, consisting of students from Howard University and others, gather in front of the White House, Monday, Nov. 24, 2014, in Washington, after the Ferguson grand jury decided not to indict police officer Darren Wilson. WASHINGTON (AP) — President Barack Obama appealed for calm and understanding in Ferguson on Monday after a grand jury decided not to indict in the death of Michael Brown, pleading with both residents and police officers to show restraint. "We are a nation built on the rule of law, so we need to accept that this decision was the grand jury's to make," Obama said. In a late-night statement from the White House, Obama said it was understandable that some Americans would be "deeply disappointed — even angered" that police officer Darren Wilson wasn't indicted. Yet he echoed Brown's parents in calling for any protests to be peaceful, saying that their wishes should be honored as they grieve their son. At the same time, Obama sought to dispel the notion that race relations have deteriorated, the protests in Ferguson notwithstanding. He called for Americans to turn their attention to ways to bring police and their communities closer together. "That won't be done by throwing bottles. That won't be done by smashing car windows. That won't be done by using this as an excuse to vandalize property," Obama said. "It certainly won't be done by hurting anybody." Yet the scene playing out in suburban Missouri, just minutes after the grand jury's announcement, stood in stark contrast to Obama's calls for calm. As Obama spoke live from the White House briefing room, television networks showed Obama on one side of the screen, and violent demonstrations in Ferguson on the other. Police said protesters smashed windows, vandalized police cars and threw rocks at authorities as anger erupted after the announcement Monday night that Wilson, a white officer, wouldn't be indicted for shooting Brown. The death of the unarmed, black 18-year-old in August sparked weeks of protests that authorities feared would be revived after the grand jury's decision was handed down. Outside the White House, a few hundred people protested peacefully, holding up signs reading "Justice for Michael Brown" and chanting "Hands up, don't shoot" — a refrain that's become a rallying cry in Ferguson since Brown's death. "This is not just an issue for Ferguson, this is an issue for America," Obama said. "There are still problems, and communities of color aren't just making this up." Obama, who has faced repeated calls to visit Ferguson, said he would "take a look" at whether such a visit would now be wise. The Justice Department is conducting a separate investigation into possible civil rights violations that could result in federal charges. Attorney General Eric Holder called Brown's death a "tragedy" and said federal investigators were taking pains not to jump to conclusions. "While constructive efforts are under way in Ferguson and communities nationwide, far more must be done to create enduring trust," Holder said. The uproar sparked by Brown's death has challenged Obama to find constructive, measured ways to address the deep racial tensions exposed by the incident without alienating law enforcement or casting undue blame amid ongoing investigations. In 2012, Obama spoke passionately after the death of teenager Trayvon Martin, telling the public that "if I had a son, he'd look like Trayvon." But the circumstances in Ferguson were different, with a police officer claiming self-defense, and Obama has sought to avoid inflaming racial divisions. In his remarks on Monday, Obama urged the country to channel its frustration in ways that would be constructive, not destructive. He said within his own life, he had witnessed "enormous progress" on race. "To deny that progress, I think, is to deny America's capacity for change," Obama said.